G. Rag Y Los Hermanos Patchekos have probably the hardest to remember band name ever. What is probably supposed to be funny feels to me a little silly. Even though their music contains strong Mariachi elements, a shorter band name would have been more appropriate. They are not the first German band trying to sound like Calexico. Los Mañanitas and Calaveras did this before without reaching the same flair as the masters from Arizona. Anyway, Truck Stop and Gunter Gabriel are the unreachable kings of German country music. However, the fourth album by the eleven musicians from and around Munich surprised me at least partially a lot. G. Rag like to describe their music as Latin rock containing various influences like country, folk, swing, tango, indie and pop music. The four band members who form the brass section are responsible for the album’s highlights, but Lucky Goddamn contains heaps of other interesting instruments like trumpets, horns, clarinets, banjos, guitars, drums and a vibraphone. The opener Morphine starts with a vibraphone before distorted vocals with such a retro and lo-fi feeling set you in the mood of the O Brother, Where Are Thou soundtrack. This is also the first place you meet the brass section. Tango 9 is a pure Mariachi instrumental. This and some other tracks on the album make you feel like on a holiday trip in Mexico. I especially like Hobo Train that sounds a lot like Calexico, and the curious combination of classic country and calypso oil barrels on Pretty Boy Floyd. The rag doll like Viper Drag is another highlight on the album. Unfortunately G. Rag can’t keep that same high level during the entire album, and some songs like Riverboat, Kriegerabschied and Trip Inside are a bit unspectacular compared to the rest of the album. 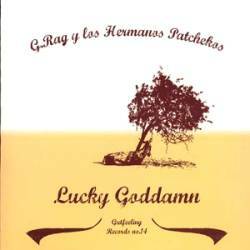 Even if not each of the fourteen songs on Lucky Goddamn is a smasher, G. Ray have nevertheless shown that Americana influenced rock music can be very interesting. The album is quite diverse and that may help them to find a huger audience for their music which doesn’t suffer from a too strong German background, especially as there’s often some humour, although well hidden, in the songwriting.